The 2006 Mustang GT, now that it's a few years old may just be one of the best bargains yet. While Mustang prices, including the new 2011 Mustang 5.0 liter GT are reasonable, considering the performance and refinement you get, not all of us can afford. But a nice low mileage 2006 Mustang GT can fulfill your performance aspirations and help your budget. And with the variable valve timing and three valves per cylinder you get 300 horsepower on good old regular gas. Fuel economy's nothing to sneeze at, with this 4.6 liter V8 engine either. With and EPA rating of 17 mpg city and 25 mpg highway, it's pretty fuel efficient for such a powerful power plant. The 06 Ford Mustang GT package includes Four wheel ventilated discs, with ABS, combined with electronic traction control. Also improving traction is a limited slip differential and a well tuned suspension. 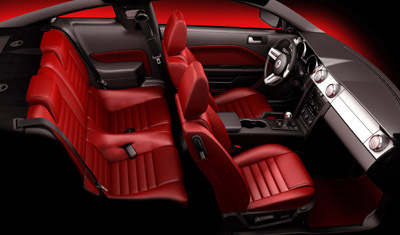 The interior of the Gt includes both sport related features as well as the kind of appointments you'd expect like 12volt power outlets for your electronic devices, an electrically adjustable driver's seat, a decent sounding factory sound system, and more. One of the features I like in the convertible, is a feature you'd see in a high end mercedes. When you open the doors, the windows lower slightly to make opening and closing them easier and saves the major air compression on the convertible roof like you see in other cars when you try to close the door. Like it's 2005 cousin, the 06 Mustang GT carries on the retro styling, reminiscent of the late 1060' and early 70's Mustangs. With it's classy and crisp sounding stainless steel mufflers, you get that familiar Detroit V8 sound. Now that this fifth generation Mustang has been around awhile, there's no lack of inexpensive exterior and engine add-ons to personalize your car to suit your tastes. From body kits, to superchargers, to pre painted chin spoilers, the possibilities are endless and only limited to your bank account. And with the money you'll be saving, you can proably afford a few good pieces to make this Mustang your own!